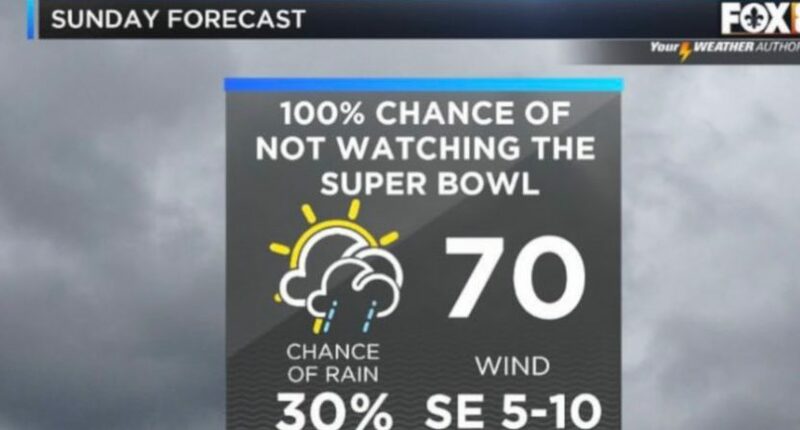 Fox 8 New Orleans weather forecast is "100 percent chance of not watching the Super Bowl"
Well, that's certainly one way to deliver a Super Bowl Sunday forecast. Unsurprisingly, fans of the New Orleans Saints continue to be very salty about the late no-call in their NFC Championship game loss to the Los Angeles Rams. We’ve seen the governor of Louisiana and congressmen on both sides of the aisle complain about it, we’ve seen a senator take it to the U.S. Senate floor, and we’ve seen a (eventually unsuccessful) lawsuit against the league. And now, we’ve seen commentary on it (and on the proposed Super Bowl boycott) from Fox’s New Orleans affiliate WVUE. During their weather report. Well, that’s one way to deliver a forecast! But it’s probably accurate for a number of people in the New Orleans area. And the Saints’ logo in the Fox O is a nice touch.